The second day of The North Coast Music Festival started with rain. I was afraid it would pour and turn Union Park into a mud pit, but it only ever lightly rained which was a welcome way to help us all stay cool. First up was RJD2 (an American DJ) with Break Science (a duo of musicians), who played an interesting mix of dub, electronic and hip-hop. From what I could tell only Break Science’s drummer was on stage, but the combination of live drums with a DJ made for entertaining listening. After relaxing with the first band, I ventured to the Magic Hat Local Stage, where I’ve been consistently impressed with the local talent Chicago has to offer. 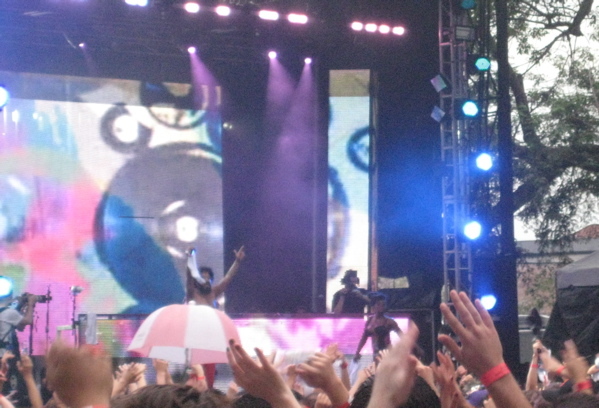 There I found Nameloc rocking the crowd with dubstep. I’ve become much more familiar with dubstep in the past few days, and find it incredibly easy to dance to, and also full of rhythmic intricacy that the music major in me definitely enjoys. If you’re interested in checking them out I recommend a mixtape they did with La Roux called Lazerproof. It’s available here for free download. 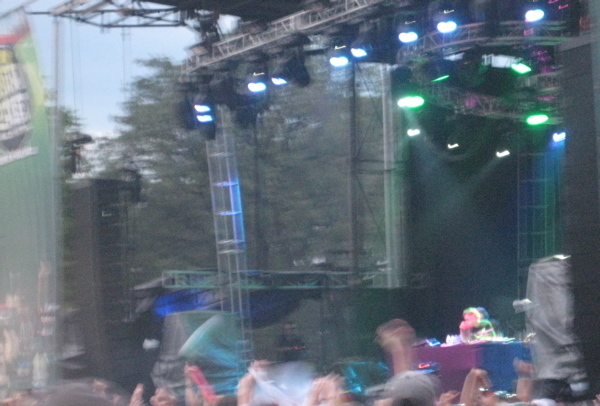 Immediately after Rusko, Common played on the adjacent Named After Groupon Stage. Yes, he’s critically acclaimed, writes great lyrics, and has even been invited to the White House to perform, but did he keep me going after many hours of dancing? Not really. His smooth style of hip-hop just didn’t draw me in. At a different venue, however, I’m sure I could more easily appreciate his talent. I stayed at his set a few minutes, and then found myself migrating to Carl Cox‘s techno-y house music at the Red Bull Grove Stage. His music is intense, tinged with jazz, and great fun. If you ever get the chance to check him out please do! Lastly, I mistakenly saw STS9, assuming that Fatboy Slim would be playing the largest stage, when he was actually at the smaller, side stage. STS9 is a five-piece electronic collective from Santa Cruz, and was a very down-tempo end to the evening. In retrospect they had a calm Kraftwerk vibe that I might have enjoyed, but I didn’t stay through the set as I assumed it was a new, disappointing direction for Fatboy Slim’s music. I’m not sure if I’d recommend STS9, except maybe as background music for a swanky lounge, and this evening I’ll be sure to double check my schedule. Maybe you should get someone that actually knows the scene, who the artists are and “knows” what genre they play to write your reviews. And someone with press credentials to get non-flip phone quality pictures. Thanks EverybodyLuvsSmurfs, the post has been updated.